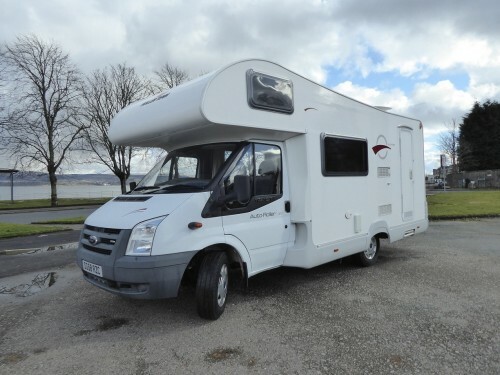 Hire motorhomes in the county of Argyllshire, and we’ll connect you to sunny motorhome owners in Helensburgh, Oban, Campbeltown, Rothesay, Dunoon plus a host of locations throughout Scotland and the UK! Make memories with Camperbug. Set in western Scotland, the county of Argyll is also known as Argyllshire and derives its name from the Gaelic word Earraghaidheal which means the Coastland of the Gael. The Gaelic-speaking Scots in Ireland invaded the region during the 2nd century. The first Scottish settlements in the region trace back to the 3rd century when chief Cairbre Riada claimed full control over the region known as Mid Argyll. Many immigrants from Ireland settled in the lands of Dalriada. The Dalriada lands stubbornly maintained a separate existence until ambitious ruler Kenneth I merged the Pict regions and the lands of Dalriada. This amalgam would eventually become stunning Scotland. Motorhome hire is perhaps one of the best ways to savour the regions rolling hills, dense forests, numerous glens plus many beautiful sea lochs. There’s room for plenty of outdoor activities including mountain biking, quad biking and kayaking. The fresh air, wilderness and abundance of flora and fauna will add a spring to your step! Keep an eye out for cute Wallabies who were imported from Australia by an eccentric aristocrat! Enjoy Argyllshire with Camperbug’s motorhome hires and create memories to last a lifetime! I am rosieroller, hire me today! Ford Transit, Roller Team, Auto Roller 500. 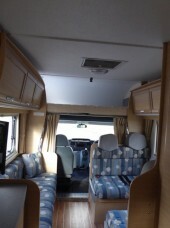 The motorhome is a modern and comfortable 4 berth with two seperate sleeping areas, as well as kitchenette, bathroom with chemical toilet and shower.